High mountains and deep wadis (valleys) with sufficient prey, permanent water, adequate cover, and freedom from persecution. Current: Proven to currently exist only in the Dhofar region of Oman, Hajjah and Al Mahrah governorates in Yemen, and the Judean Desert and Negev highlands of Israel/Palestine. Solitary, except when females come in heat and they form short-lived pairs. Outside of the breeding season leopard ranges may overlap in which case different leopards will use the same routes or tracks while moving from place to place. Arabian Leopards are potentially active at any time of the day or night. Around 50% of camera-trap records in Oman and Yemen occurred during the day with peaks of activity in early morning and late afternoon; midday activity is more common between November and February. As the season warms up the animals become increasingly nocturnal. Males patrol large territories. Radiotracking of Arabian leopards in Oman has shown that individuals may cover more than 500 kilometers in a single month. Mating occurs frequently during each female’s five-day ‘heat.’ From 98 to 100 days later, she gives birth to a litter of from one to four cubs in a naturally protected den such as a cave. The cubs are born blind and remain so for up to ten days. Although the cubs don’t usually leave the den for the first month of their lives, the mother may move them periodically to prevent them from being discovered. The cubs are naturally curious like most cats and explore a wider area as they grow older. Nubian Ibex, Arabian Tahr, Mountain Gazelle, Indian Crested Porcupine, Cape Hyrax, Cape Hare, the foxes, and various partridges may all be hunted by the Arabian leopard. As leopards are highly adaptable it is possible that they eat other animals including mongoose, genets, honey badgers, snakes, lizards, hedgehogs, rats, and mice. An adult Hamadryas baboon would probably be too difficult for the small Arabian leopard to tackle, but perhaps young baboons are taken where the species' ranges overlap. It has also been suggested that Arabian Leopards could potentially eat migratory locusts during mass emergences as Snow Leopards have been recorded doing. Wild: Population estimates vary wildly depending on the optimism of the estimator. Current estimates range from fewer than 100 to no more than 250. UAE: probably extinct; the maximum carrying capacity of Arabian leopards in all of the Emirates has been calculated at from 10 – 15 individuals with no recent confirmed records. A possible leopard track was photographed in Wadi Wurayah on September 15, 2007. 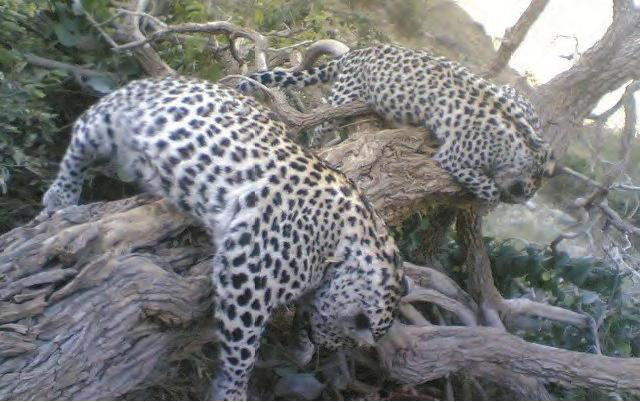 Oman: confirmed; circa 30 individuals camera trapped by the Arabain Leopard Survey on Jebel Samhan (17 individuals) and Jebels Qara and Qamar (9 – 11 individuals) in Dhofar since 1996; extinct in Hajar Range (last specimen found killed in 1976); presumed extinct in Musandam peninsula (no confirmed reports since last two specimens killed in October 1997) although Biosphere Expeditions reported in November 2007 that it had found definite leopard sign during its expedition to Musandam in January and February of that year. 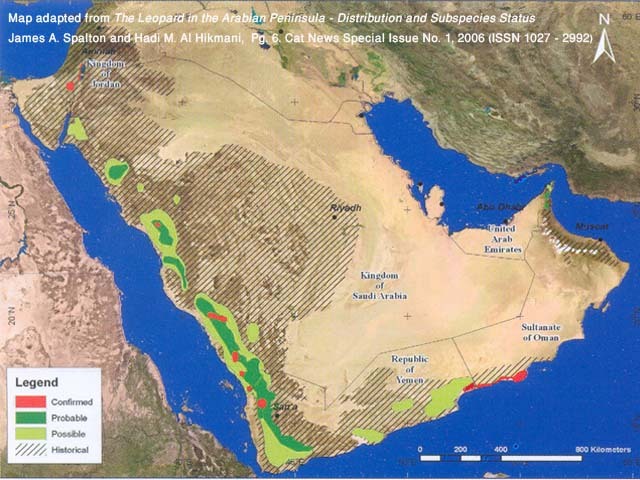 Saudi Arabia: possibly extinct; the potential Arabian leopard population in Saudi Arabia has been calculated at from 60 to 425 individuals based on habitat assessment. However, the last confirmed record from Saudi Arabia was of two animals poisoned in An Namas in Spring 2007. A large camera trap survey is currently underway in the Kingdom under the direction of the National Wildlife Commission in Taif. Yemen: confirmed; scats collected in Hajjah in January 2009 tested positive for Arabian Leopard DNA. More recently, a female was photographed in the Hawf Protected Area, Al Mahrah on January 11, 2011 and a male was photographed at the same location on February 24, 2011. Habitat destruction and prey depletion caused by unregulated hunting are probably the two main threats to the Arabian leopard throughout its range. Prey depletion leads to livestock depredation and retaliatory killing of leopards by angry pastoralists. Another major threat is posed by trapping for the illegal wildlife trade. This is particularly true of the Yemeni population as Yemen is a poor nation surrounded by wealthy countries in which animal collecting is fashionable. On February 9, 2011 Dr. Urs Breitnmoser, co-chair of the IUCN Species Survival Commission Cat Specialist Group, stated at the closing ceremonies of the 12th Conservation Workshop for the Biodiversity of Arabia, "Unless drastic action is taken across its range, I'm afraid that the Arabian leopard is not going to make it." In other words, unless all countries in the region cooperate for the in-situ conservation of Arabian leopards, they will become extinct in the wild.